Magic’s gone as season four of Syfy’s hit drama, The Magicians, begins. The new season is set to premiere on January 23, 2019 and will find Eliot inhabited by The Monster and our favorite Brakebills students unaware of their pasts and with new non-magical identities. 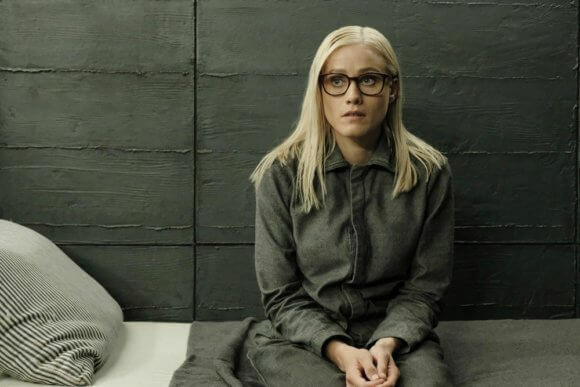 Plus, Alice (played by Olivia Taylor Dudley) is imprisoned by the Library. The cast and executive producers of The Magicians took part in a Q&A at the San Diego Comic Con and also participated in roundtable interviews. During our interview, Olivia Taylor Dudley talked about what’s happening with Alice in the new season, Alice’s relationship with Quentin, and how she approaches the different versions of Alice. Is “Dark Alice” truly evil? Olivia Taylor Dudley: “No. I think you’re referring to Niffin Alice when she’s like off. I think that that will be her forever struggle is what she did as niffin. But I think that she became somebody different. Like, Elliot right now is a monster so when he comes back from being a monster – if that ever happens, I don’t know – he’ll probably struggle with the same thing: what did his physical body do while it was off being somebody else? Do you view these different Alices as separate characters? Where will catch up with Alice as season four begins? She knows what happened, but her friends don’t. What kind of state do we find her in mentally and emotionally in season four? Do you feel comfortable after playing her for four seasons to talk to the writers if there’s something you don’t think feels like Alice? Olivia Taylor Dudley: “Yeah, for sure. It’s rare that they would ever write something like that. I think the only thing they would ever make me uncomfortable as Alice is if they made her too funny. I know it’s not a fan favorite to not be funny, but Alice isn’t funny. She has dry humor which is the only kind of humor I like. What about her relationship with Quentin? Olivia Taylor Dudley: “Their relationship is my favorite thing about the books and the show. I miss it. I wish they were still together, but I think it’s a long journey for them. We’ll see – depending on how many seasons we get! (Laughing) But I think they’re magnets. No matter what, they’re going to always love each other. Right now, in this fourth season we’re filming they’re not together at the moment, but I’m sure that we’ll explore that relationship. We never haven’t explored it so I’m sure we will at some point. What have you learned from playing Alice? Has she taught you anything? Olivia Taylor Dudley: “She’s taught me a lot. She’s given me a chance to play somebody who I normally don’t get to play. She’s definitely not typecast for me. I normally play something very different, but she’s the kind of character I’m interested in, so I don’t know.